(yWeekend) By Xu Fan. February 12, 2009. Wang Hongwei has been over at Cambridge University more than one year already, and he was an eyewitness of the "shoe throwing" incident: The perpetrator was less than half a meter away from him; that person had whistled before he threw the shoe; Wang had pushed him twice to ask him "not to make noise." But Wang was deeply sorry that he could stop the person. Recently, the Chinese media have reported how the calm demeanor of Premier Wen Jiabao at the Cambridge University has shown the composure befitting a grand nation. On February 4, Beijing Youth Daily was early in reporting the unfortunate interference with Premier Wen's speech. Youth Weekly has now contacted the Chinese students at the Cambridge University in order to learn the details about the support for Premier Wen. On February 10, the perpetrator went in front of the court in Cambridge for the first time. 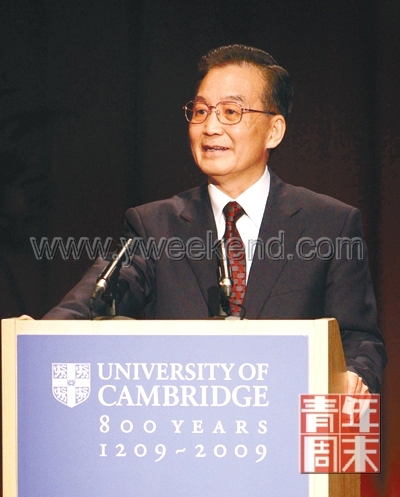 At around 3pm (GMT) on February 2, Premier Wen delivered a speech at the Cambridge University. As the speech reached the end, a foreign male sitting in the back suddenly began to whistle. While the security guards were not paying attention, he threw a shoe out. The audience was quite incensed. They yelled "Get out!" and "Shame!" At the moment Premier Wen said calmly: “Teachers, students, such a despicable trick can not block off Sino-British friendship between the two peoples. The progress of mankind and the harmony of world is the tide of history, so there is no force to stop!” This drew the applause of the entire audience. This man was subsequently arrested by the British police and has been charged with a public order offence. According to the British media, the perpetrator has been identified. He is a 27-year-old German named Martin Jahnke, a senior graduate student of pathology at the Cambridge University. Among the many Chinese students who witnessed the "shoe throwing" incident was Wang Hongwei. He is the vice-chairman of the Chinese Students and Scholars Association of the Cambridge University and a doctoral student of engineering at the Cambridge University. He was special because he was sitting right behind the perpetrator at the time of the incident. "If you are facing the podium, then that man would be sitting in the back of the left hand side of the auditorium. There is an elevated stage behind him with some added seats. If I bend down, I can see him clearly. He had made some disruptive noises and I tried to stop him twice." Wang Hongwei recounted what happened over the telephone to the yWeekend reporter. On the afternoon of February 2 (GMT), Premier Wen gave the Rede Lecture which has a 500 year history at the Cambridge University. The title was "See China in the Light of Development." As the speech reached its end, Premier Wen particularly mentioned Joseph Needham, the famous technology historian at the Cambridge University. These friendly words drew the teachers and students into familiar grounds. At that moment, a different kind of sound arose from the audience. "As soon as that man made the first whistle, I sensed that something was wrong. But I did not think much because I thought that someone had inadvertently made some noise. But then I heard people getting stirred up around me." So Wang Hongwei followed the noise and looked down the stage. He found out that the noisemaker was sitting in front of him. "He was a white European male. After he made that long whistle, he stood up and yelled excitedly at the stage. I was very angry and I felt that he was being very rude. I leaned down, tapped his shoulder and told him: "Stop making noise." He looked very angry and excited, and he turned about to take a look at me." Wang Hongwei's effort did not make the man stop. So Wang turned to the Cambridge worker in charge of maintaining order and hoped that the security people can come to stop this student. "The worker was standing in the corridor while the man was sitting at the very end of the row of seats and next to the wall. The Cambridge worker may not be too experienced in handling this sort of thing. Besides nobody expected that this sort of thing would happen." Then the perpetrator got more excited. According to the video at a certain British media website, the young man kept yelling. A hand reached out from the tall stage behind him and shoved him on the shoulder once. Wang Hongwei said that this push was the second time that he warned the perpetrator. "I saw that the security people had not come over yet. I was anxious. So I pushed him harder the second time. I also told him, 'Don't make any more noise.' Because he did not want the live television broadcast showing a fight, Wang Hongwei sat back. He turned around and tried to get more workers to come over to maintain order. As he turned around, he heard a loud thud. "At first, I thought that it was just a sound of body contact. It could be that the workers were trying to stop him." When Wang Hongwei turned around, he saw that the man had thrown a shoe. "I wondered if he took off his shoe and threw it, or maybe he had taken it off already and then threw it out. The workers from the corridor were getting close to him and they were almost touching him. Afterwards, I was very sorry. If I saw what he was up to, I would have watched him closely. I would not have turned away. I would not have let him thrown the shoe out." The Chinese media have reported what happened afterwards. The Cambridge workers subdued the perpetrator and removed him from the auditorium. The Chinese and foreign audience at the scene were angered and they cried out: "Get out!" and "Shame!" Applause broke out in the auditorium. According to Wang Hongwei's schoomate Wang Yachao (who is also a student of engineering at Cambridge University), the thunderous applause lasted for almost one minute. Finally, the applause died down at the signal of the Premier. Actually, the respect of the audience towards Premier Wen was expressed even before the speech began with another thunderous applasue. At the time, the speech was about to begin and many Chinese students were very excited already. At 3:15pm, Premier Wen appeared at the scene. "I was sitting in the last row of the auditorium and I aimed my video camera at the door through which the Premier was going to enter. As soon as his right foot went past the door, applause overwhelmed the hall." Wang Hongwei was quite excited as he described the scene. As the entire audience stood up to greet him, Premier Wen Jiabao walked in steadily and stepped up to the podium. He bowed to the audience. He said: "I bow here to the Chancellor and teachers, not out of politeness but out of respect to knowledge and teachers." Once he said that, the applause was even more thunderous. Wang Hongwei used the word "stunning" to describe his feelings at the moment. As Premier Wen began his speech about seeing China in the light of development, he and his fellow students were "deeply enraptured" by the sincere words from the Premier. So it was a surprise to everyone that someone would make unharmonious noises in such a harmonious and warm atmosphere. From mid-January the news of the coming of Premier Wen made Wang Hongwei look forward to that day. "It was either January 15th or 16th. I was working in the laboratory. I had to process a large batch of letters everyday. Suddenly I saw a notice from the university to the International Office to say that people can sign up to attend Premier Wen's speech. I was very excited. This letter was being sent to various social groups in the university." Actually, as early as Christmas, Wang Hongwei had learned that Premier Wen was coming to Cambridge because Wang is the vice-chairman of the Cambridge University Students and Scholars Association. "We maintain frequent contact with the university when we organize the other activities for the group. We heard about it, but it was not yet confirmed at the time." So when the notice arrived, Wang Hongwei and other Cambridge University Students and Scholars Association officers notified other Chinese students. "We forwarded the letter to other students who signed up for the Association. According to what I know, those students who were qualified signed up after they received the notice. This speech by Premier Wen was opened only to students, teachers, workers and alumni of the university. Later I heard that certain alumni who have left the university were also able to register online. Actually, there were many applications. Not only did Cambridge people wanted to go, but many students in London also inquired." Wang Hongwei recalled. Afterwards, this reporter called Cambridge University. A spokesperson named Tim Holt explained the process of selection for the audience: "There were more than 2,000 applicants, which was far more than the capacity of the auditorium. We could only use a computer program to randomly select people among the applications. That is to say, each student had an equal probability of being selected." In the end, about 500 students and teachers were lucky to get admission tickets. At 11:50am (GMT) on February 2, Wang Hongwei arrived at the scene. 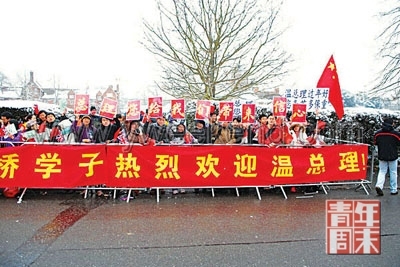 The speech was scheduled for 3pm, so Wang Hongwei and the other organizers from the Cambridge University Chinese Students and Scholars Association arrived three hours beforehand to raise the Chinese and British national flags as well as red banners. When they learned that Premier Wen was coming, they contacted many Chinese students and local Chinese immigrants to stage a welcoming ceremony. It was around noon, the temperature was five or five degrees below zero, it was snowing and a cold breeze was blowing. But the students were very passionate. "Maybe three to four hundred Chinese students showed up. That surprised us because we thought that about 200 people would show up. By around 1pm, many students had arrived. It was harsh outside because it was really cold. The Chinese students also brought around ten to twenty foreign friends." Wang Hongwei was most touched by the old Chinese immigrants who came even though they wouldn't be able to hear the Premier talk. 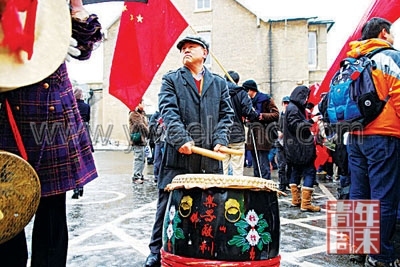 "They are from the Chinese communities near Cambridge. There were about seven or eight of them. They were old people with white hair. Since they were not students, workers or alumni, they regrettably could not get into the auditorium to listen to the speech. The roads were covered with snow at the time. They came here and brought drums and lions with them. Since the cars could only be parked at a distance away, they even had to carry the equipment over themselves. I remember that the drum was very heavy because it was almost one meter in diameter and required at least two people to carry it." They welcomed the Premier and then the speech was about to start. Wang Hongwei hurried over to the entrance of the Cambridge University auditorium. "Every person who entered had to pass security inspection. At the time, I thought that they were quite strict." To Wang Hongwei, the strictness was necessary in order for Cambridge University to receive a Chinese state leader. "There were two teams of people in charge of security inspection at the entrance. One team was using detectors to see if you were carrying any metallic objects on your person. Since many students carried cameras and video recorders, the other team was checking whether these are genuine video equipment. The workers asked every person to turn on the camera so that they can check the visual display. They will let you in only after they were sure that there is no problem." When Wang Hongwei's turn came, they asked him to take off his down jacket and they checked the pockets of his suit. "It was actually quite fast. They only took about 40 seconds to inspect me." When Wang Hongwei entered the auditorium, he saw an exciting scene. "Since I had to organize the activities outside, I went in very late. I could only sit in the extra seats added in the rear. There were many people. Several dozens seats were added." From the videos and photos that the Chinese netizens can see, the audience members were mostly Chinese students. Some netizens even noted that the Chinese students must have rushed out to buy up all the tickets to support their Premier. Concerning this point, Wang Hongwei explained: "This was not how it was. The Chinese students took part in the earlier welcoming ceremony and so they arrived early. As soon as they began to let people enter, the Chinese students went in. So they tended to sit in the center. Foreigners tend to arrive right on time and they sat on the side. The person who threw the shoe sat on the far side at the upper level." When our reporter asked Cambridge University, their spokesperson Tim Holt said: "The Chinese students and teachers accounted for half the people in the hall. Ultimately, Cambridge University is a global university with students, teachers and workers from many countries and representing many different cultures." After the incident, the Cambridge University teachers and students were very angry. When our reporter called up Cambridge University, they said: "Cambridge University is deeply apologetic about this incident. The Vice-Chancellor Alison Richard has sent a letter of apology. At present, the Chinese Ambassador to the United Kingdom Pu Ying has forwarded the opinion of Premier Wen. Premier Wen said: The main thing about young people is to educate them and there I hope that the university will continue to give him a chance to learn. At this moment, Cambridge University finds it inconvenient to comment." According to Chinese media, the Chinese students had tried to run a "human flesh search" on the perpetrator. Wang Hongwei denied this allegation. "You can't call it 'human flesh search.' Many people chatted about this incident via email; some went on the Internet to see if it was someone that they knew. This person will be charged in court on February 10. At that time, his identity will be made known. Meanwhile, it is mostly speculation now." On the day when we interviewed Wang Hongwei, the Daily Telegraph (UK) revealed the identify of this perpetrator. According to information, his name is Martin Jahnke. He is from Germany and he is studying pathology, carrying out genetic research into debilitating diseases such as diabetes, multiple sclerosis and arthritis. According to the report, Martin Jahnke has been there for a number of years and he is a tutor to undergraduate students. He also presents lunchtime seminars. He gave the impression of being "hardworking and peaceful." According to the report, Jahnke was very "discouraged" by the revelation of his identity. Jahnke has left his Darwin College dormitory and gone into hiding. (Daily Telegraph) Cambridge shoe protester is German pathology research student. By Richard Edwards. February 7, 2009. Sources have confirmed that the man arrested over the incident is 27-year-old Martin Jahnke, a senior postgraduate member of the pathology department who has been at the university for several years, tutoring undergraduates and presenting lunchtime seminars. He was detained after throwing his left shoe at Wen Jiabao and shouting that the university was "prostituting itself with this dictator" during a lecture given by the Chinese Premier on Monday in Cambridge. Footage of the incident has proved a hit on the internet, with YouTube videos receiving almost one million hits, but the "out of character" stunt has left the quiet and diligent student in deep trouble – facing the prospect of a criminal record and possible suspension or rustication from the university. Mr Jahnke has told friends that he is "upset" by the fallout and he has gone into hiding, temporarily leaving his accommodation at Darwin College this week. He is due to appear at Cambridge magistrates court on Tuesday, charged with a public order offence. Chinese officials described the protest as a "despicable" act and said that Gordon Brown expressed his personal regret to Mr Wen in a letter. Cambridge's vice chancellor, Professor Alison Richard, also "sincerely apologised" for the episode. The university attracts more than 600 Chinese students a year and are currently engaged in a recruitment drive from Hong Kong. Officials said that they are taking the matter "very, very seriously". A formal, internal complaint is expected will be heard by the Cambridge University Advocate, Professor Christopher Forsyth, who is a crown court judge, barrister and chair of Public Law and Private International Law at Cambridge. Sanctions include a fine, suspension or rustication from Cambridge. As part of a study group of graduates under Professor John Trowsdale, which includes two Chinese students, Mr Jahnke carries out important genetic research into debilitating diseases such as diabetes, multiple sclerosis and arthritis. He has had his work published in the Journal of Biochemistry and has delivered lunchtime seminars to other graduate students. The 27-year-old is also a leading member of the university caving club and takes part in regular expeditions in Wales, the south west and north of England. Applicants to attend Mr Wen's speech were vetted and security was tight. Almost 2,000 students and members of staff applied for the 500 tickets available to hear the lecture entitled "See China in the Light of Her Development". The prime minister had spoken for 40 minutes and was five minutes from finishing his speech when the protester stood and shouted: "How can the University prostitute itself with this dictator here?" and "How can you listen to the lies he's telling?" He threw the shoe as he was bundled out of the lecture hall and missed the prime minister by ten feet. Had it hit him, Mr Jahnke may have faced a more serious charge of assault. The audience, comprising students and staff, turned on the student, telling him to "get out" and shouting "shame." Reports suggest that many in the audience were Chinese students. The protester was then led out of the building by proctors and security staff before being arrested and charged with a public order offence by police. The incident was thought to be inspired by the shoe-throwing protest directed at George Bush in January. Muntader al-Zaidi, an Iraqi journalist, threw his shoe at the former American president and faces up to 15 years in prison if convicted for the offence. Mr Jahnke was unavailable for comment. A spokesman for the university refused to discuss the identity of the protester.